Computer problems and network issues fall into three general categories. Software, Hardware and human. 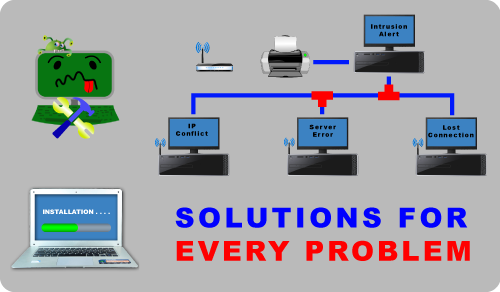 Sometimes these solutions are easily found, but other times it may be a lengthy process to troubleshoot to find the correct solution. A common problem that users find is that over a period of time their computer slows down to a crawl. This can be due to a number of reasons, from running resident stealth processes, bloated registry entries to malware/virus. Sometimes it is cheaper to do a clean installation of the operating system and software than spend many hours in trying to manually fix those problems. That it is wise to always backup your data to an external drive so if a clean install has to be performed you still have your data. Other problems that can plague your computer or network system are hardware problems. The commons are Random Access Memory (RAM) and hard drive failure. Once again that is why it is important to always back your data to an external hard drive. For more information about what we offer contact us from our contact page.